From small beginnings, these five London food companies have created a niche market for their products, all made by traditional methods and using the best ingredients. Barry Rogg must be one of the only people in London who still pickles cucumbers and herring in the traditional Jewish way. 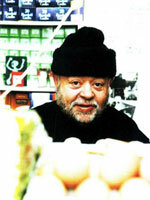 His shop, a delicatessen near Aldgate, was started by his grandfather in about 1911, then run by his mother and uncle. He joined the business in 1945, meaning to stay only for a couple of years ("My ambition was to be a layabout," he says) but today, more than 50 years later, he's the only one left. "My uncle said to me when I first started: `You can either sell good stuff or rubbish. You'll make a fortune if you sell rubbish, but you can't do both.' Unfortunately I stuck to the former." While be speaks, Barry brings freshly fried pieces of halibut and cod from the kitchen and adds them to the other traditional Jewish food on display. Chopped chicken liver, egg and onion, gefilte fish, salt beef, fried fishballs, pickled herring in lemon, mammoth olives, giant Spanish onions, vine tomatoes, old-fashioned cakes and pastries, and fat King Solomon dates all jostle for space with buckets of cucumbers in brine layered with garlic and bay. There's also a really salty dried brown herring-"If you haven't got blood pressure, it'll give you blood pressure," Barry says - as well as hot salt beef on Sundays from 9 am. This shop is from another era: "It's the personal type of business that will gradually become extinct," admits Barry. Visit now, before it does. Rogg's Jewish Deli, 137 Cannon Street Road, (0171) 488 3368.